Trinity College Dublin was founded in 1592 and is one of the world’s leading universities, the best in Ireland and consistently ranked in the top 100 globally. For over 400 years, this historic institution has been a world leader in high-quality, internationally-recognised education. The University brings together a vibrant international community of almost 17,000 students and 2,860 members of staff and its stunning campus of historic buildings and cobblestoned walkways is juxtaposed with its state-of-the-art facilities and world-renowned centres of excellence. Student life at Trinity College Dublin is about much more than education: with over 200 sports clubs and societies ranging from athletics to tennis, debating to investing, and drama to science fiction, there is something to suit every interest. Trinity is also one of the world’s only universities to provide all undergraduate students with a personal Tutor – a dedicated faculty member who can offer academic, personal and professional guidance throughout the four year degree programme. Trinity’s bustling 47-acre campus is an oasis in the very heart of Dublin, a vibrant and safe European capital city. The university’s city-centre location offers students a unique opportunity to blend a rigorous academic programme with an unparalleled array of cultural, social and professional experiences. A wealth of museums, theatres, galleries, cafes, restaurants and historic tourist sites are located right on Trinity’s doorstep. Upon successful completion of an undergraduate or postgraduate programme at Trinity, students have the opportunity to stay in Ireland to work for one year on the Third Level Graduate Scheme. Trinity’s Career Service was ranked 2nd in Europe (ISB 2015) with 95% of Trinity graduates in employment or further studies within 6 months after completing their studies! Trinity Business School is ranked as one of the Top 30 Business Schools in the World (Eduniversal 2015/16) and has been pioneering cutting-edge research, teaching and learning in management and entrepreneurship for nearly a century. Trinity Business School recently launched an innovative new business course for undergraduate students, the Bachelor in Business Studies Degree, which is designed for students who wish to focus on business from the very beginning of their degree. 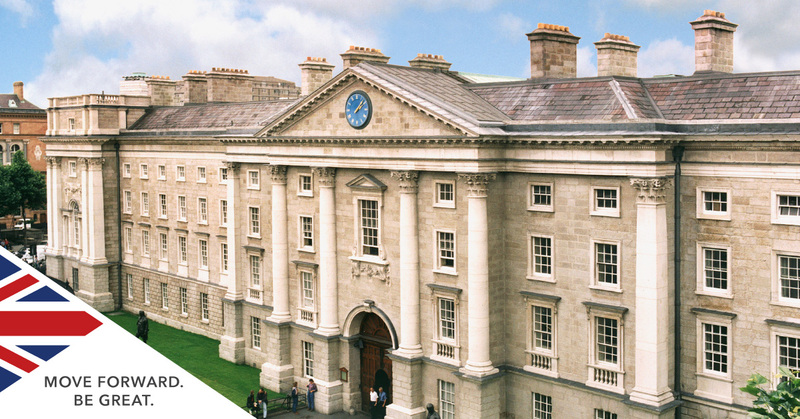 Are you interested in applying to study at Trinity College Dublin in Ireland? If so, arrange a free consultation today and meet them at the forthcoming UK University Fair in London.